This post 4 of 4 in the series Banjo Roots and Branches. The world of the banjo expanded greatly in the second half of the 19th century. Touring blackface minstrel performers began popularizing the instrument with white Americans starting in the 1830s. Some white Southerners learned to play the banjo from African Americans prior to that, but the extent to which it happened is unknown. Banjo manufacturers supplied instruments to professionals and amateurs alike. Instructional manuals gradually shifted from teaching the down-stroke techniques that persisted from the banjo’s African ancestors to an up-picked guitar style of playing. Guitar style would develop in different ways among white and black banjo players, eventually laying the foundation for bluegrass banjo playing in the 1940s. 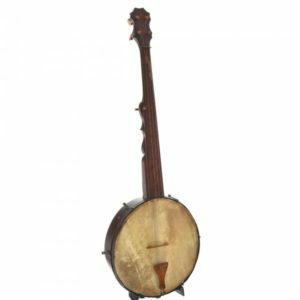 By the turn of the 20th century, the banjo had emerged as a common parlor instrument in middle class American homes and was played in a variety of musical styles. This is the fourth of four posts that mine the latest scholarship on banjo history from the book Banjo Roots and Branches (University of Illinois Press, 2018). The first post explored the African roots of the banjo. The second post discussed developments that took place in the Caribbean in the context of the transatlantic slave trade. The third post examined and contextualized the earliest references to the banjo on the North American continent. This post delves into the growth in popularity of the banjo and the exchange of banjo playing between African Americans and European Americans. In his chapter “Black Banjo, Fiddle, and Dance in Kentucky and the Amalgamation of African American and Anglo-American Folk Music,” banjoist and researcher George R. Gibson shows how Kentucky fiddle and banjo music and dance are the result of both African American and European American people. In the process, he challenges some previous held conceptions about the banjo. He theorizes that, rather than developing in the Caribbean, the banjo may have been created in Africa by Luso-Africans. Luso-Africans are creoles of mixed Portuguese and African ancestry. Gibson references a 1620 quote by Richard Jobson stating that instruments found along the Gambia River have “pinnes they winde and bring to agree in tunable notes.” This quote may describe tuning pegs, a defining feature that distinguishes it from its African predecessors. Other writers in the book determined that these European design elements were added in the Caribbean. Gibson notes that the Portuguese had been in Africa more than one hundred years by 1620, and that Luso-Africans may have combined these European and African elements into the banjo during that time. Gibson also challenges the commonly-held idea that minstrel performers were the first white people to play the banjo. Joel Walker Sweeney and Archibald Ferguson are the first known minstrel banjoists in the 1830s, but Gibson argues that whites were learning the banjo prior to that in the South. The only documented white banjoist prior to 1828 was James Hollyday in the 1740s or 50s. Hollyday played the banjo in Maryland among people in slavery who were owned by his mother. Gibson notes that whites and blacks were living in close proximity in Kentucky and other parts of the South. They interacted socially and played music together for dances. There were black fiddlers in Kentucky by 1780 and a documented banjo player by 1781. Establishing that white fiddlers were adopting music from African Americans, Gibson determines that whites must also have been learning banjo at this time. This is certainly reasonable, but concrete historical evidence has yet to be found to support it. Blackface minstrel performances that featured the banjo began making the instrument popular with middle class whites by the 1840s. Manufacturers, including William Boucher and the Dobson Brothers, William A. Cole, H.C. Fairbanks, and James Ashborn, produced banjos and sold them to minstrel performers and non-performers alike. The bodies of these instruments were no longer made from gourds. Instead, they were constructed with wooden hoops, as they are today, which are easier to mass produce consistently than gourd bodies. Wood-Rimmed Minstrel Banjo built by William Boucher, Jr. 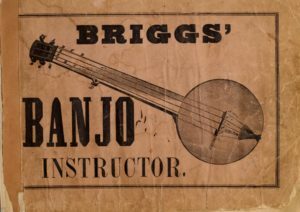 Starting with Briggs’ Banjo Instructor, published in 1855, books provided instruction on how to play the instrument. A series of these banjo tutors followed, including Phil Rice’s Method for the Banjo (1858), Buckley’s New Banjo Method (1860), Frank Converse’s Banjo Without a Master (1865), Frank B. Converse’s New and Complete Method for the Banjo (1865), Buckley’s Banjo Guide (1868), and others. The banjo tutors are available for free download on Tim Twiss’s website and elsewhere online. They are a great resource for understanding banjo-playing techniques and repertoire during this time period. In Banjo Roots and Branches, Jim Dalton examines the tutors to analyze the relationship between the intonational practices and repertoire of the banjo. Dalton finds that the repertoire became increasingly complex in the 1850s and 1860s. The evolving musical features of the repertoire corresponded to the transition of the banjo from an unfretted to a fretted instrument starting around the 1860s. Frets are metal strips inserted into the fingerboard of stringed instruments that divide the neck into fixed segments of intervals. 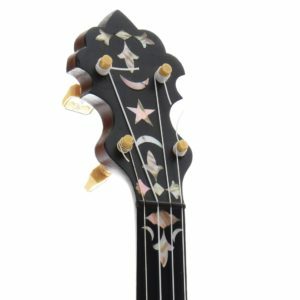 Fretted instruments (banjos, guitars, mandolins) are generally easier to play in tune than unfretted instruments (violins, violas, cellos), though the nature of the fixed intervals requires some compromise in intonation. 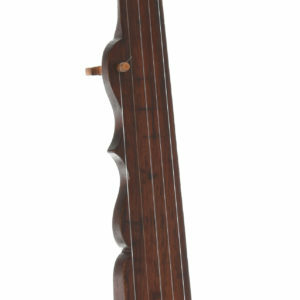 Most banjos today are fretted, but fretless banjos are still popular with some players. 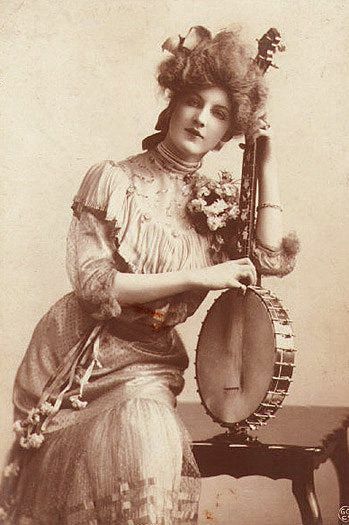 Between the Civil War and the turn of the 20th century, the banjo continued to grow in popularity. Banjo promoters, including manufacturers like S.S. Stewart, successfully sought to make the banjo at home in the Victorian-era parlors of middle-class Americans. 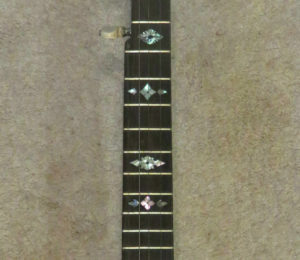 Manufacturers made instruments that were smaller in size and had intricate pearl inlays in the neck and headstock. Promoters deliberately disassociated the banjo from its African roots. As evidenced by the banjo tutors and late 19th century recordings, the dominant playing style changed during this period. It transitioned from the early down-stroke style (a.k.a. stroke, clawhammer, or frailing), as it was played by earlier African American musicians and blackface minstrel performers, to an up-pick style, now referred to as guitar banjo style or classic banjo style. As the name implies, guitar banjo borrows the up-picking technique from the guitar. The repertoire of the banjo also expanded to include sentimental songs of the time, European waltzes, mazurkas, polkas, and the new American style of ragtime, which has its origins in African-American communities. 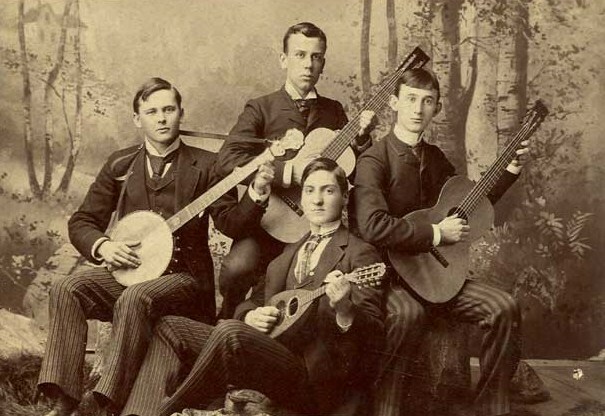 Banjo, Mandolin, and Guitar Clubs were common in the late 19th and early 20th centuries. These groups, featuring stringed instruments of various sizes and shapes, became especially popular on college campuses. Sylvester Louis “Vess” Ossman was a leading banjo player and one of the most recorded artists of the late 19th and early 20th centuries. Starting in 1893 he recorded hundreds of ragtime songs, marches, cakewalks, popular songs, and intermezzos for various early disc and cylinder recording companies. The parlor banjo movement is often thought of as exclusively white, but in Banjo Roots and Branches, researcher and banjoist Tony Thomas shows how African Americans were part of it. Thomas examines banjo player Gustavus “Gus” Cannon’s life and work to show how popular musical trends and banjo playing techniques were evident in his recordings. Previous commentators have assessed that Cannon’s playing style emerged from black folk banjo traditions, or that his style was “unorthodox.” Thomas shows how the recordings he made between 1927 and 1930 actually demonstrate that he was an up-to-date professional musician well-versed in the music of “the big world of the banjo” of the late 19th and early 20th centuries. Cannon was born on a plantation in Marshall County, Mississippi in 1883. As a young adolescent, he learned both down-stroke and up-pick banjo techniques from African American banjo players in the Mississippi Delta. He began playing banjo and fiddle for black country dances at age 14. Most of Cannon’s early musical experiences were in the Mississippi Delta, where ragtime music was pervasive. African Americans there called most secular music, including early blues, “ragtimes.” Cannon learned to play traditional black fiddle tunes as well as newer ragtime, show, and dance music. He enjoyed W.C. Handy’s twenty and ten piece brass dance bands that played throughout the area. Around 1908 Memphis, Tennessee became his new musical home. He toured with medicine shows, played for dances, and put together a jug band. For the new dances that were developing in the black South, Cannon played up-to-date “swinging, raggy music,” as Thomas calls it. Thomas cites Cannon’s recording of “Jazz Gypsy Blues” as an example. Cannon was part of the early 20th century show business world of traveling musicals, medicine, tent, and minstrel shows that spread new dances and songs into remote areas. The music he recorded and his playing style reflect that. Cannon was a master of several different banjo playing techniques, including guitar style, clawhammer, strumming, and 2-finger up-picking. Cannon recorded “Walk Right In” with Cannon’s Jug Stompers in 1929. The song was a hit for the Rooftop Singers in 1963. 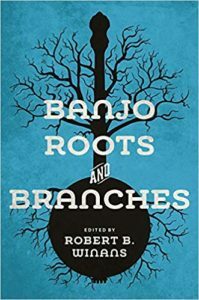 In the final chapter of Banjo Roots and Branches, editor Robert B. Winans examines a style of banjo playing that is prominent in the Piedmont area of North Carolina and southern Virginia. Referred to by many of its practitioners as “old country style,” it came into prominence in the late 1920s and 30s. Several of its practitioners indicate that they were influenced by the two-finger playing of African American guitarists. The style shows one of the ways that up-picked guitar banjo evolved with white musicians. Old country style is an up-picking style that uses the thumb and index finger. It is generally played in a band context, not by solo banjoists. It incorporates syncopated, arpeggiated chords, and bass runs to provide rhythm and harmonic structure to a song. Two and three-finger up-picking styles had largely replaced down-stroke playing in the Piedmont in the early 20th century. Winans looks in detail at some of the prominent players of this style, including Glenn Davis (1909-86), Daner Johnson (1879-1955), and Kelly Sears (1907-84). Daner led the way at the turn of the 20th century for other Piedmont banjo players in this technique, though he used three fingers instead of two. He did not make any recordings, but Sears claims that his own recording of “Little Old Log Cabin in the Lane” was played in Daner’s style. Our knowledge of the banjo is still being shaped by the work of scholars, including those that contributed to Banjo Roots and Branches. While not a comprehensive history of the banjo, the book sheds new light on the instrument’s roots in Africa, its development in the Caribbean, and its spread and traditions in North America. An endlessly fascinating instrument, this is certainly not the last of my posts about the banjo.